How to Protect Your Sofa from Pets? We live in a world of constant growth, stress and chaos. Amidst all this, we look for companions to calm our emotional turmoil. Those who have pets as their companions and close confidantes are some of the luckiest beings on earth. Pets turn out to be amazing listeners and mood boosters, helping us to cope with the ups and downs of life. After a long, busy day, all you want is to cuddle up with your pooch on your comfy and cozy sofa. But do you know that sharing your couch with your pet’s paws and claws can mean risking the huge investment you’ve made to increase your home’s aesthetic value? The white fur and a turquoise blue sofa don’t really make an attractive and contrasting fashion, do they? Don’t let this thought depress you and put you in a spot where you have to make a choice between your favourite companion and your living room’s beautiful sofa. Here is a list of tips that will protect your sofa and make your furniture pet proof. Why don’t you use covers? This is considered to be the best way to safeguard the couch since covers are easy and quick to clean. You may cover your sofa and other furniture items with slipcovers, throws or washable over-blankets. Commonly, every pet has a favourite place to lay; make sure you use a cover on his favourite space to avoid the mess. Does your pet love to jump and play on the sofa? Then it’s time that you begin teaching your pet new habits. Earn his respect with the help of obedience commands, for example, tell him to sit, stay and get down. Command him to get off the sofa and go to his own bed. Note: dog training is based on two fundamentals – consistency and repetition. Consider using leather and microfiber furniture as these are pet proof furniture materials. Not only does a leather sofa give a very luxurious and elegant look to the living room, but also cleaning it is a cake walk. Wipe down the material, and you’ll be amazed to see that it doesn’t even attract any pet hair or fur. On the other hand, microfibers are a must if you own a cat. This is because microfibers are durable and designed to repel wetting. Invest in an exactly similar pet bed for your furry best friend. Make sure it is made of the same colour and fabric. And place the pets’ couch next to your sofa. This way he wouldn’t feel left out. If the answer for you is “No Pets on the Sofa”, you can invest in a pet bed for your furry best friend that is made of the same colour and fabric as your couch. Place it next to your sofa so he wouldn’t feel left out. 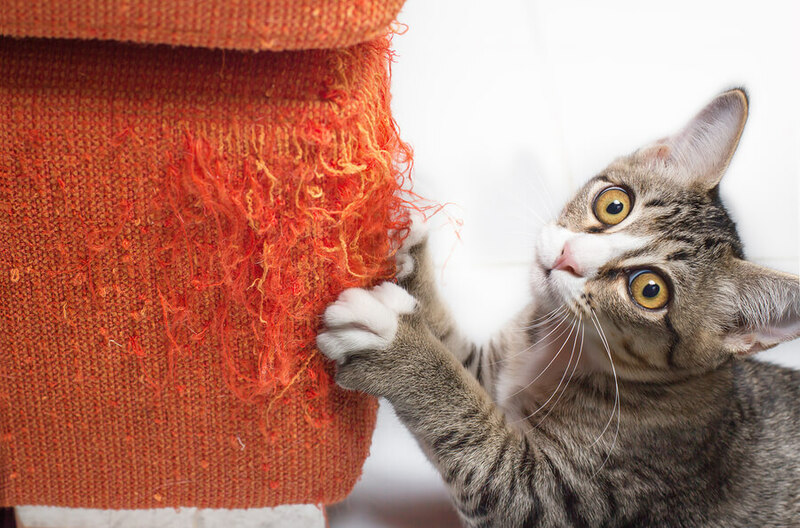 Apply these tips to keep your upholstery safe and secure and your pet happy. Last but not the least; remember your rules and don’t get carried away by your furry companion’s compassionate and kind eyes, begging to join you on that comfy and warm sofa.